The 2013 Ontario Rural Summer Jobs Service designed to support employers in creating summer jobs for young people in rural Ontario. The program is accepting applications until April 30, 2013 from eligible rural employers who plan to create summer jobs for students. Eligible businesses and community organizations may receive a hiring incentive of $2 per hour. The maximum available is $1,120 per full-time position for businesses or organization is located in a town, small city or rural township with a population of 100,000. For further information on the Rural Summer Jobs Service program, including the application, visit the ministry’s website, call 1-888-588-4111 or email: rsjs.omafra@ontario.ca. Is your generator ready to go? With today’s weather you may need your generator for power. Is your generator ready to go? Checklist for PTO Driven Generator. More information on generator maintenance and operation can be found on the Ontario Ministry of Agriculture and Food website. Examining shipping information is an essential part of assessing production and identifying opportunities for increasing revenue. 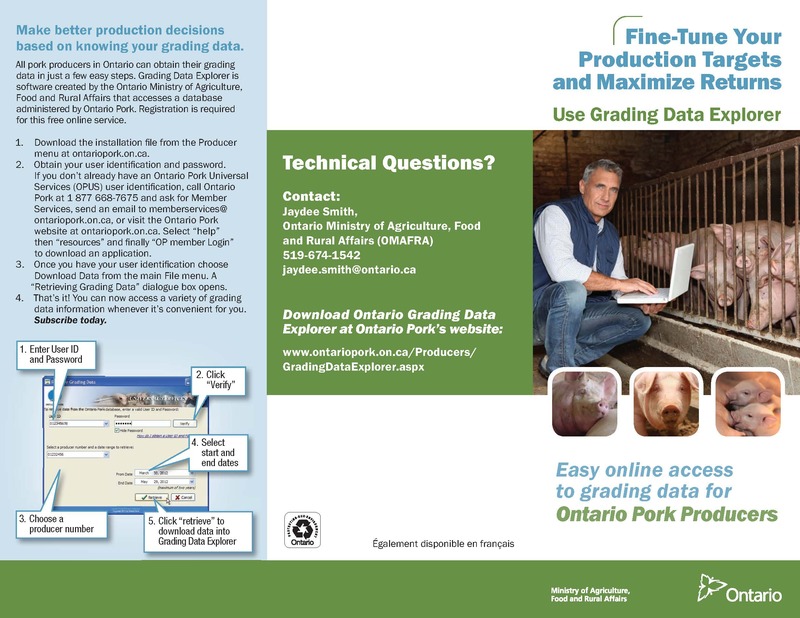 If you missed picking up our brochure on the Grading Data Explorer at the London Swine Conference you can access the program on-line.